It all dates back to the Chicago World’s Fair, the biggest event ever to hit the city, and hotel space was at a premium. So no one looked twice when local resident H.H. 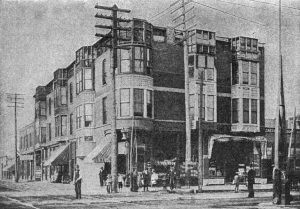 Holmes broke ground and began working on a hotel that would go on to take up an entire city block. What those watching from the sidelines did not know was that H.H. Holmes had more than lodging on his mind. In fact, if he had his way, many of the guests who checked into his property would never check out. The murderous history of this newly-built hotel would put fictional counterparts like the Overlook Hotel and the Bates Motel to shame. H.H. Holmes was actually an alias, and this notorious murderer was known by many different names during his short and violence-filled life. But no matter what name he used, it is clear that the hotel he built was designed to be a place of murder, not a place of rest. Mr. Holmes was able to keep his plans secret through a number of clever devices, including changing contractors and individual workers on a regular basis. Ostensibly done to punish poor workmanship, these staff changes were actually designed to stop outsiders from becoming curious about the strange nature of the project they were working on. And strange they were. Some of the rooms in the hotel were equipped with special vents, supposedly for air conditioning but actually used to spray poison gas and knockout drugs. Other rooms were soundproofed, so the neighbors would not hear what was going on inside. Other rooms were designed to be actual ovens, used to roast victims alive while they pleaded for mercy. There were also hidden staircases, hallways to nowhere and blind turns designed to disorient victims and make escape impossible. All in all, it was a hotel designed for murder, and during the course of the 1893 Chicago World’s Fair, that design was put into practice. In what later be dubbed the Murder Castle, H.H. Holmes perpetrated one of the worst murder sprees in American history, perhaps becoming the first known serial killer in the country. Even after all these years, hard numbers are hard to come by, since many of the dead were domestic workers, maids, prostitutes, drifters and others whose deaths were less likely to arouse suspicion. While hunting strangers in the corridors of the hotel was a favorite pastime of Holmes, one of his earliest victims was Julia Smythe, Holmes’ mistress and the wife of a man named Ned Conner. Conner moved away when he learned of the affair, leaving Julia and her daughter Pearl behind with a man who would ultimately become one of history’s most prolific serial killers. The very layout of the hotel Holmes created is straight out of a horror novel. Rooms could be locked from the outside, making escape impossible. One third floor room, where at least one victim met their end, was designed like a bank vault or giant safe, complete with padding to muffle screams. That room was also equipped with a gas pipe, which Holmes used to asphyxiate his victims. There was also an elaborate system for rendering and disposing of victims. When police began their investigation, they discovered a hidden shaft that led directly the basement of the hotel. In the basement, detectives found a number of disturbing items, including quicklime pits and even a butcher’s table. They also found evidence of the victims, including bloody clothing and a watch. That watch, a woman’s model, was eventually traced to a woman named Minnie Williams. Minnie was known for her beauty, and her fortune of at least $75,000. That fortune no doubt attracted the attention of Holmes, and he may have used the money to finance his attempted escape. Minnie’s sister also fell victim to Holmes and his murderous plans. Among the items found in the basement turned dungeon was a garter buckle. That buckle had belonged to Minnie’s sister. It is known that H.H. Holmes killed at least nine, although he confessed to some 30 murders when he was later arrested. Some criminologists and historians put the death toll for Mr. Holmes far higher, with figures running as high as 200. No matter what the final body count, the case of H.H. Holmes and his Murder Castle remains one of the strangest, and one of the most troubling, in American history.